How to use Joomla 3.7 Custom Fields? The new shiny glamor of Joomla 3.7 is Custom Fields. It is an amazing feature that empowers you to integrate numerous elements right into your articles and gives more functionality and design elements. Adding multiple attributes is now quite easy with the new Custom Fields feature of Joomla 3.7. 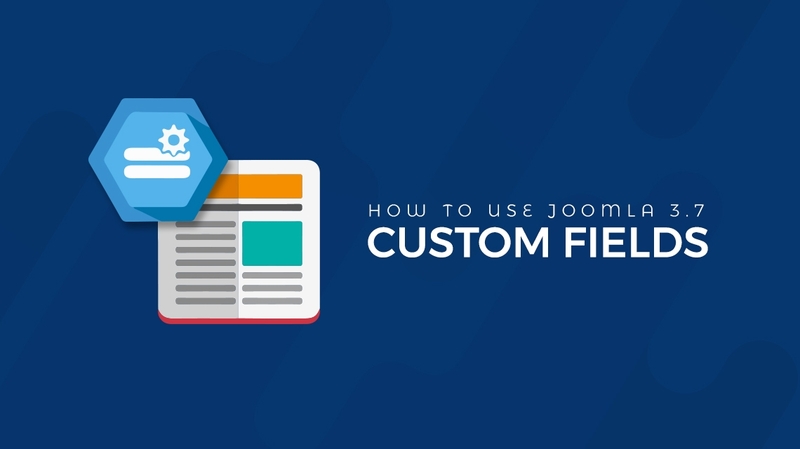 In this article, we are going to describe how you can use Joomla 3.7 Custom Fields and get the maximum output from it. Let's start by giving huge thanks to the Custom Fields project contributors. Custom fields are the much-awaited feature since the release of Joomla 3. In Joomla 3.7, there are 15 different types of fields options like calendar, lists, checkboxes etc. In articles, the Custom Fields arrive at separate tabs and you can customize it there to show the attribute in your article. Now let’s have a detailed view on Custom Fields. Custom Fields can hugely save your time by offering ready-made attributes or information at the fingertips to use repeatedly and effortlessly. In the Content tab, there are two options “Fields” and “Field Groups”. In the Fields page, you can create the custom fields and on the Field Groups page, you can create a group of fields. First, we are going to make a field group and then some fields under it. After this, we will try to implement it in articles. To create a field group, open the Field Groups option under the Content tab. In the upcoming window, click ‘New’ to make a new field group. After that, a new window will pop up. Give your field group a title and some description. Then set the status to published. Here we have created a field group named “Mobile Specification”. In the Fields page, click ‘New’ to add new fields. There are a few options you have to fill while adding the new field. Title: Give your field a title. Name & Label: You can add them or they will be automatically generated from the title. Description: Add a short description of your field. Required: Set the option to 'Yes' if the field information is must in the article. Type: There are 15 different types of field. Use the required types relevant to the field. Default Value: You can set a default value for your fields here. Filter: Control your content appearance by filtering the input. Maximum Length: You can define a maximum length of the input. In this tab, you can add a placeholder, render class, edit class and customize few things. What most important here is the automatic display. You can set the automatic display option of the field after the title, before display, after display or you can set the display to No to add the field manually into your article. Select the field group and categories here. You can set the category to all or just to some specific categories, or just a single one. Now, let's recall, we have created a field group named “Mobile specification”. Now we are going to add some fields to it. Here we just added the title and description and set the type to text. Here we just added the title and description and set the type to the calendar. What extra you have to do here is that you have to add some radio values. Here we have added two new values 'Yes' and 'No'. Using this field type, you can make a list. Here we've made a list of features. You have to also give them values. In this field, what extra you have to do is adding some checkbox values. Here is one done for you. Here we just added the title and description and set the type to color. Now, so far we have created a field group named “Mobile specification” and six different types of fields inside the field group. Now we are going to use them in our article. Let's go to the Articles menu and create a new article. Here you can see, in the new article editor box, our created field group 'Mobile Specification' is there in a separate tab. Now it’s time to put data into our fields. Go to the Mobile Specification tab. There you can see six input fields that we've created earlier. Input your data per the requirements. Now click the field button in the editor. There is a list of the fields in the Field group. Add them to the article. Now see the output in the article. In this article, we've tried some of the basic functionalities of Joomla 3.7 Custom Fields. We will publish more articles regarding this awesome feature. Meanwhile, please don't forget to share your thoughts and suggestions with us in the comment section below. Signing off, thanks for reading. Is there a way to download it as a PDF-file? Hi Jan Kijlstra, thanks for reading the tutorial. You can save this webpage as a PDF using Google Chrome 'CTRL+P' print command. Just press CTRL + P, and select 'Save as PDF' from the Destination. Hi David, you can utilize Custom Fields in your articles to enjoy smoother and faster publishing experience. At the same time, you can beautify your articles using the SP Page Builder. So, the both technologies offer you a richer publishing opportunity together. Thank you! Great article fox! I really am looking forward new custom fields guides especially about how to change positions of them in the article placements and how to css better and fast, so for example we can have different positions of different fields in the articles for a better article layout etc. Thanks for sharing, hope to have them coming for more design within Helix3 templates. Hello any update on the custom fields positioning please? For example what if I need those those fields to appear on the top right corner of the article? Can anyone suggest something regarding this. Thanks. Great tut. I'd like to see how much this can be extended. Sure, Michael, we'll explore more goodies in Custom Fields (including other new Joomla 3.7 features). Thanks for being with us. 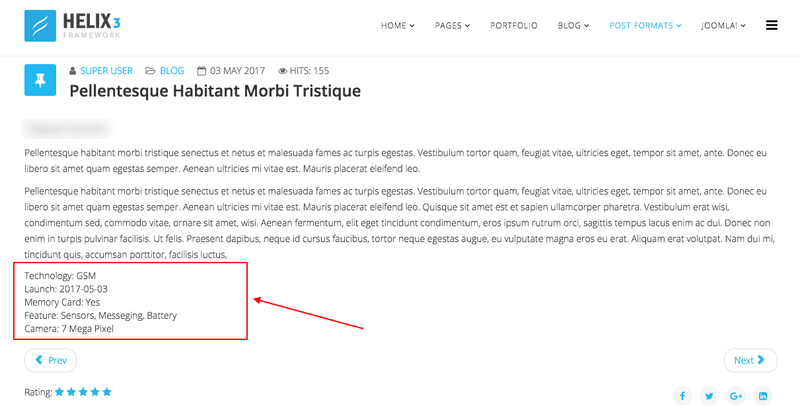 Is it possible that the custom fields are not show in blog view? Or maybe after the title of the article? You can overwrite the code for hiding the custom field in te blog view or you can hide it by CSS. And yes you can show custom fields value after the title. You will get this option while you create or edit custom field group. 1. The output of the "color" field -- is there a way to actually apply the color to an element (background of a div or text color in a span, for example)? Oh my God, I should start crying right now Joomla! is super scalable and extendable now! Fantastic and thanks for this nice walk-through Joomshapers. Thanks for the information. But you are getting default Joomla components or plugins in the Discover? After upgrading to newest Helix 3 the Article Infos started to dissappear on hover, a previous versions bug started to arise again. Fyi. Please make sure that Mootools isn't conflicting with tooltips. How exactyl i can be sure of this ? Thanks in advance. I have the same problem..
Is there any way to use this custom fields in sp page builder? I wonder if there's a direct way to filter articles based on these added fields? I want to use more Filed Group in an article, and also I want to see the name of Field Group in article. Because I dont' want to see lots of mixed lines after my article. Last thing; why I see lines of Fields in blog view? Can I close to see it? Thank you so much. I tried this now, and the Field Group came before the page content. How do I move down to bottom after the content?